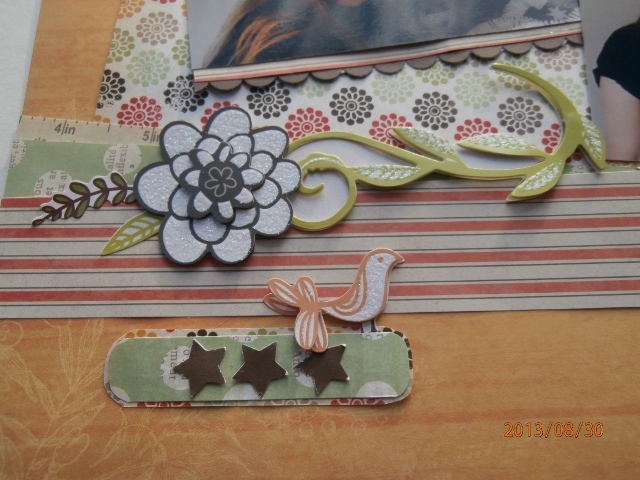 I have a layout to share that was submitted at Colorful Creations for the September Song Challenge (septsong12) that I'm hosting. You can see my challenge here. 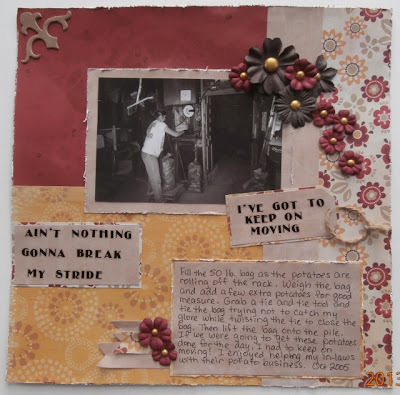 The song I chose is from the band Men at Work and the title of their song is, "Ain't Nothing Gonna Hold Me Down." Didn't want no one to hold you, what does that mean? Is that the reason you're running so fast? Simply use word(s) from the lyrics to create any project of your choice... a tag, card, layout, digi or altered item. Here's my layout titled, "Ain't Nothing Gonna Break My Stride." I also used the words "I've Got to Keep on Moving" on my layout as the subtitle. This is me, helping my in-laws with their potato farming business. I just pulled the 50 lb. bag of potatoes off the rack and set it onto the weigher. Then I grabbed a tie and the twisting tie to close the bag. 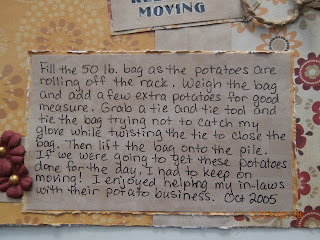 Each bag was stacked in piles according to the variety of potatoes. It was ridiculously back-breaking hard work... but we still managed to have some laughs and created some wonderful memories. Every year for many years, I took a week vacation from my office job to help them. Boy, were those LONG days! 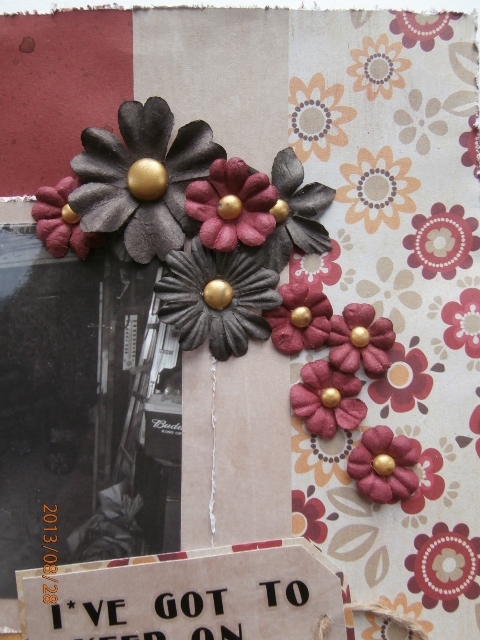 I used dark brown and maroon colored flowers for this grouping with my home made gold gems for their centers. 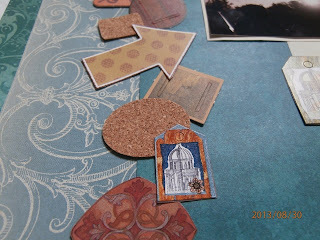 The corner chipboard was inked with distress stain and mist. The edges the background cardstock and photo matting were distressed. 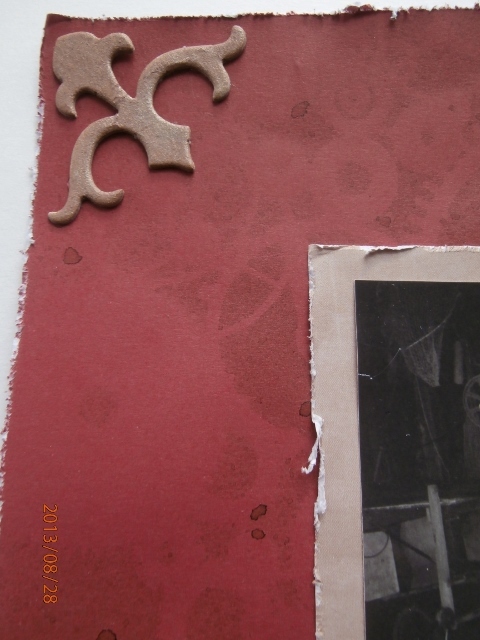 I used a gears stencil for the background. 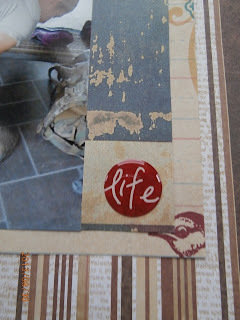 Love this stencil! 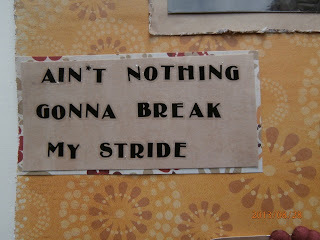 This is my page title. Here's a better look at the stenciling. My page subtitle is on the lower corner of the photo. 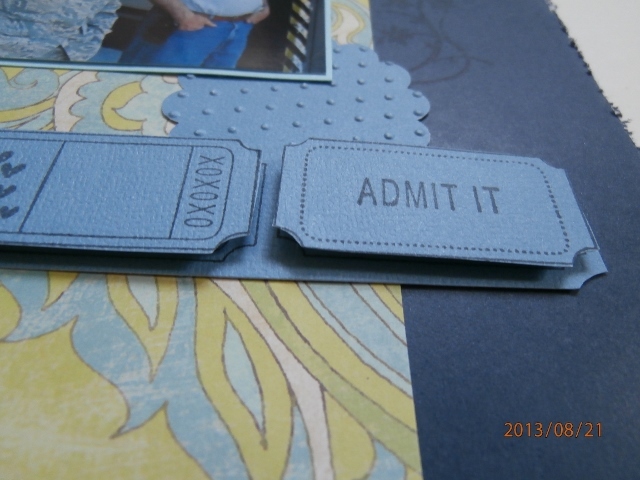 I used a hole punch and knotted twine through the tag. Banners were added to the left of the journaling block with a couple more flowers. The journaling block was matted on pp and the edges were distressed. And a closer look at the flowers. I hope I've inspired you to join in on the fun at Colorful Creations. 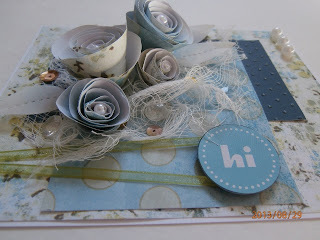 Stop on by... there are lots of other fun challenges every month! Just click on the "Events" tab at the top of the Main Page and you can see all the Challenges. I have a layout to share that was submitted at Archi-scraps for their September Inspiration Photo Challenge. You can see the challenge here. 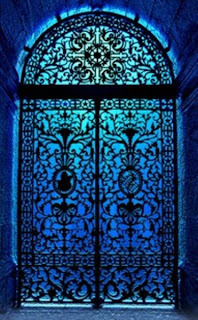 Criteria: Use the color Blue on your layout. 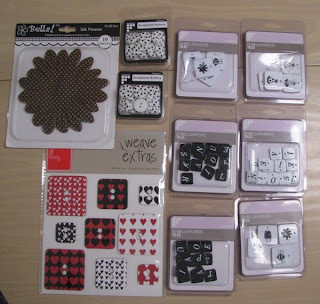 Large spotted flowers, chipboard buttons, 2 packs of spotted buttons and 6 packs of tiles for embellishments. Total value is approximately $20! 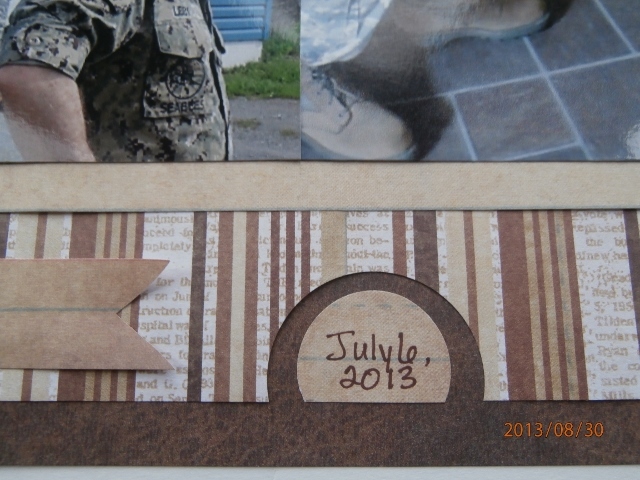 I hope you will join us at Archi-scraps this month. Entries are accepted until the OCTOBER 7! 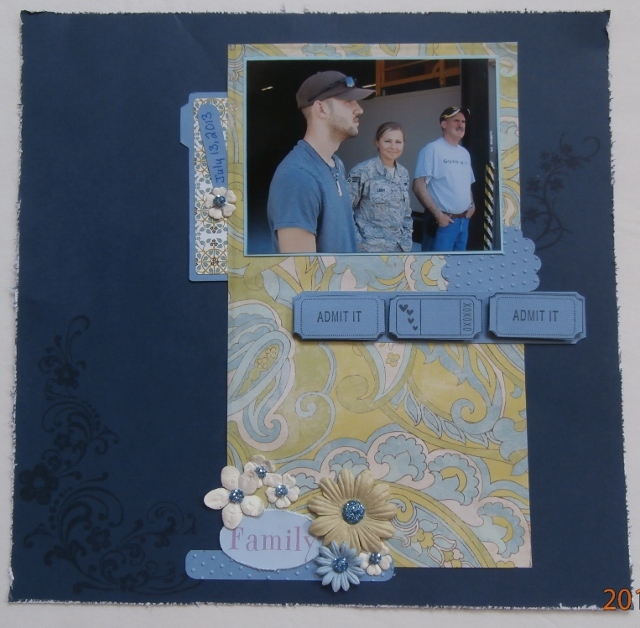 So... you have LOTS of time to get inspired by the photo above and create your layout. 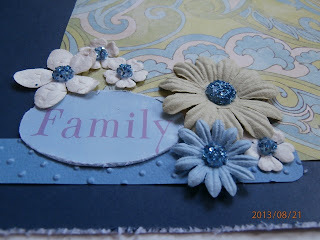 Here's my layout titled, "Family," which was used as one of the Design Team Member's example layout. 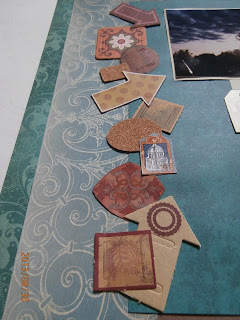 You can see the rest of the DT's layouts here. Love this photo of the family taken last month. 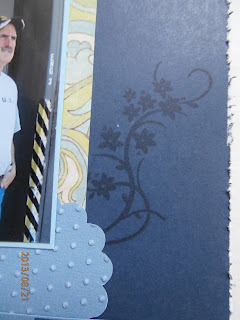 I was inspired by all the swirls from the Inspiration Photo and the blue and black... the black swirls stamp reminds me of the photo, as well as the pp My background is dark blue to represent the Inspiration photo also. 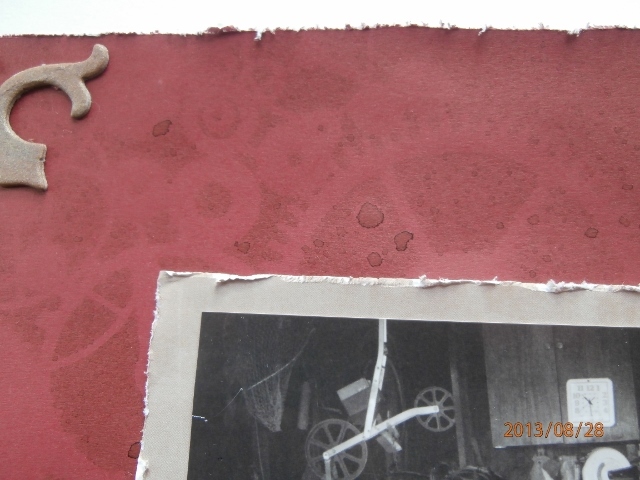 The pp card on the file folder is from Webster's Pages. 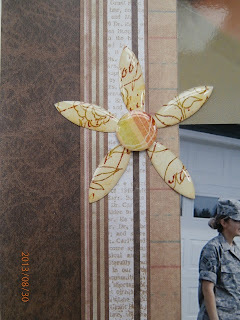 The date was added on a small tag and tucked just under a flower with a home made gem in the center. 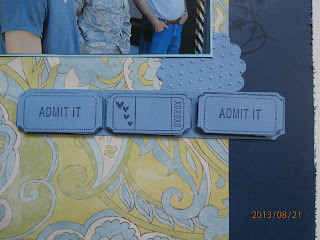 I stamped the tickets twice... once on a single piece of cardstock... then again... and cut them out and adhered them onto the top stamped image with pop dots for dimension. 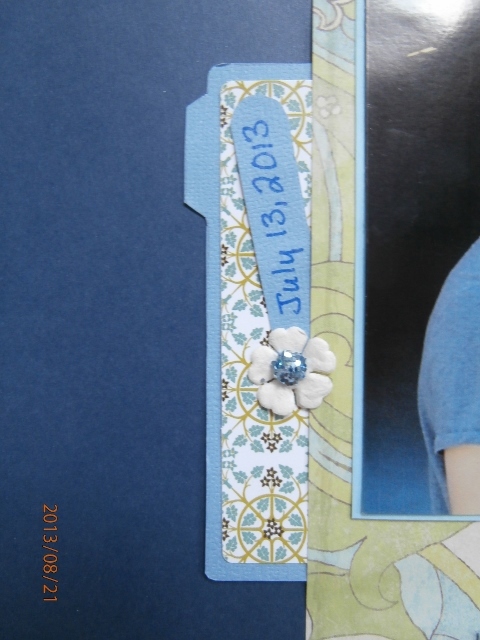 The flower punch was embossed and tucked under the photo. The outer edges of the cardstock was distressed. Love this swirly flower stamp! Here's a better look at the dimension. 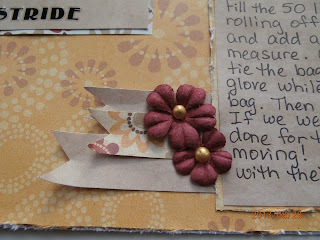 Flowers were grouped around the page title. The edges of the sticker title was distressed. 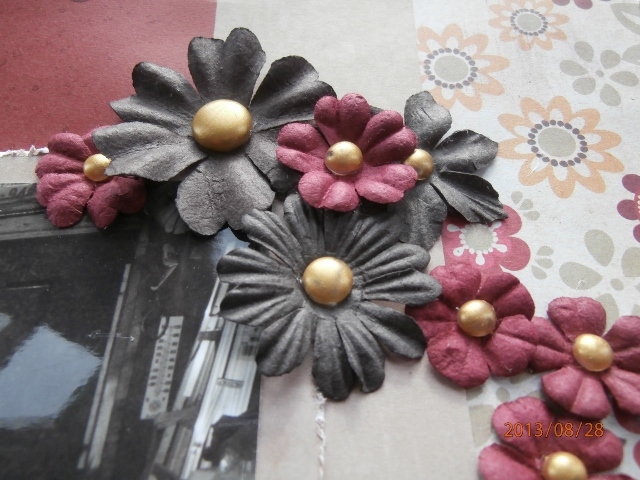 Home made gems were placed in the flower centers. The rectangle cardstock under the title was also embossed. 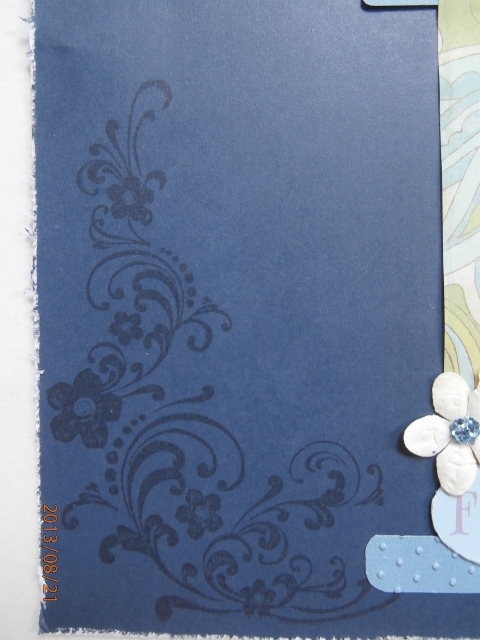 A larger corner flourish was added in the lower left of my page. Another look at the flower grouping. 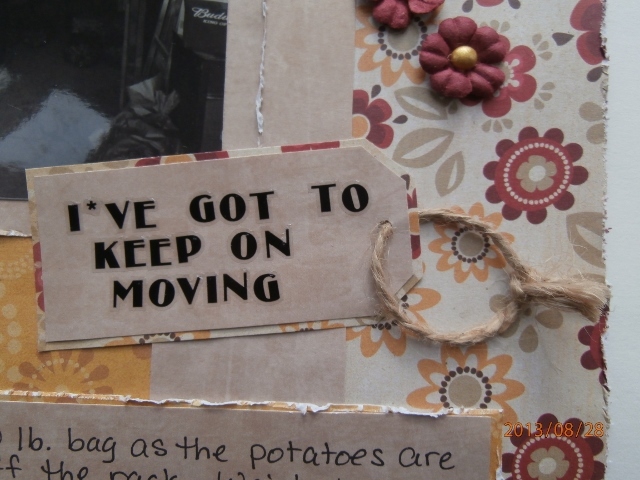 Hope your Saturday is off to a great start! This Saturday is LOTS better than last Saturday... so I'm not gonna complain at all!! Here's a layout I'd like to share with you that was submitted at Soul Scrappers for their Around the World - Germany Challenge (ATW9). You can see the challenge here. 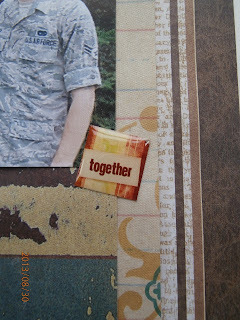 The challenge runs until Sept 25th... so you have lots of time to join in on the fun! 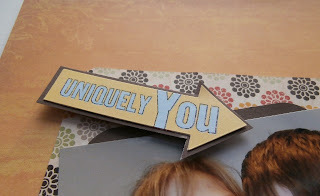 Lots of inspiration in these photos! 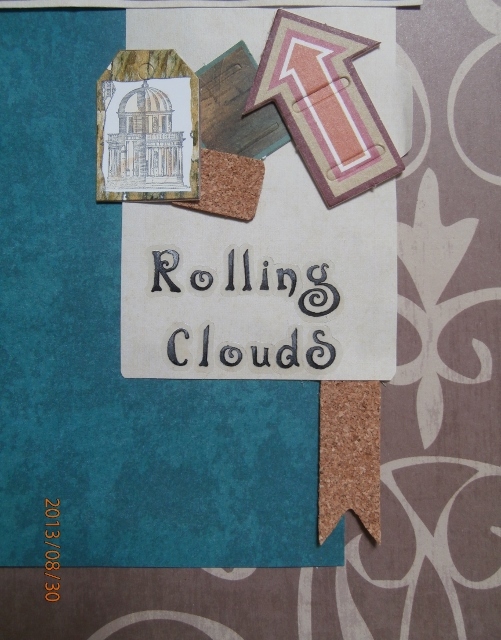 Here's my layout titled, "Rolling Clouds." I was inspired by the 1st photo (the skies) and the 3rd photo (architecture). This photo was taken in 1992. The clouds were so dark and thick! 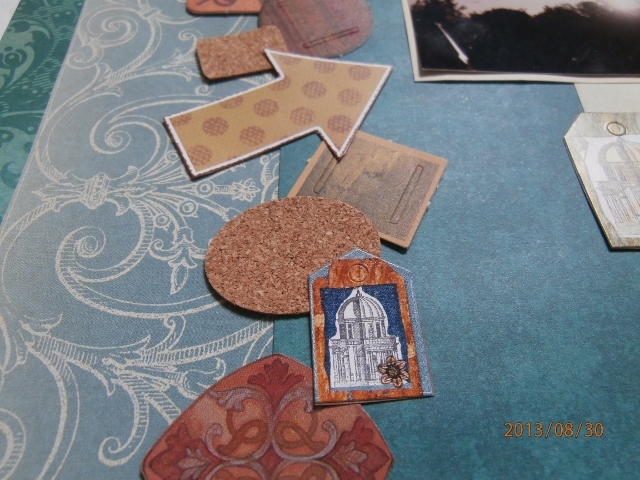 Various die cuts and shapes are above the page title... and a rectangle cork board shape was cut into a banner below the title. Here's a better view of all the shapes along the left of the photo. A closer look at some of the shapes. 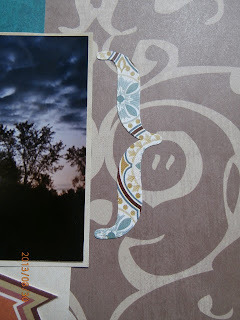 A large bracket was added on the right of the photo. 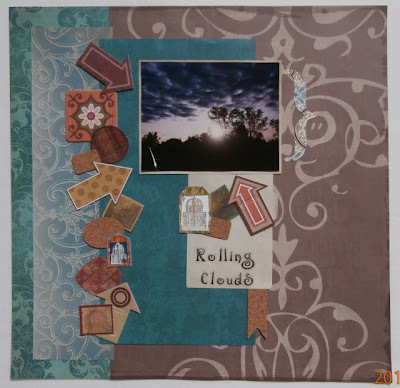 I have another layout to share with you that was submitted at Colorful Creations for their Sketchy Tuesday Challenge (STAugust). You can see the challenge here. And here's my layout titled, "Uniquely You." Dylan and I. His face is all red because he just came in from playing outside... and it was hot out! 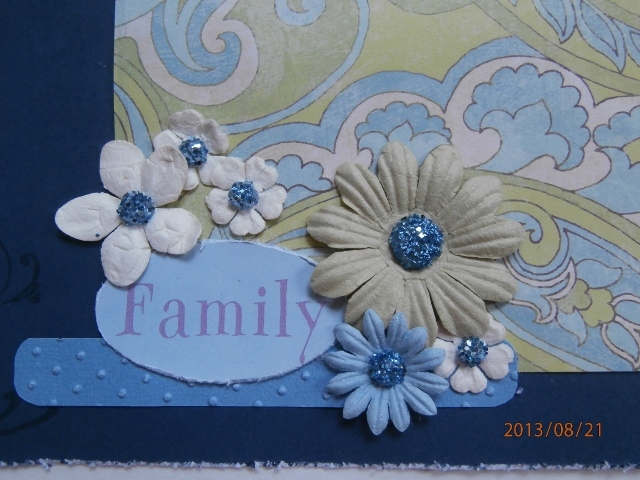 The sticker was adhered onto cardstock, trimmed and pop dots added under it for some dimension. 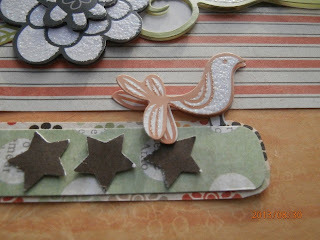 These 3D embellies even have glitter on them... so cool! Isn't this little bird cute? 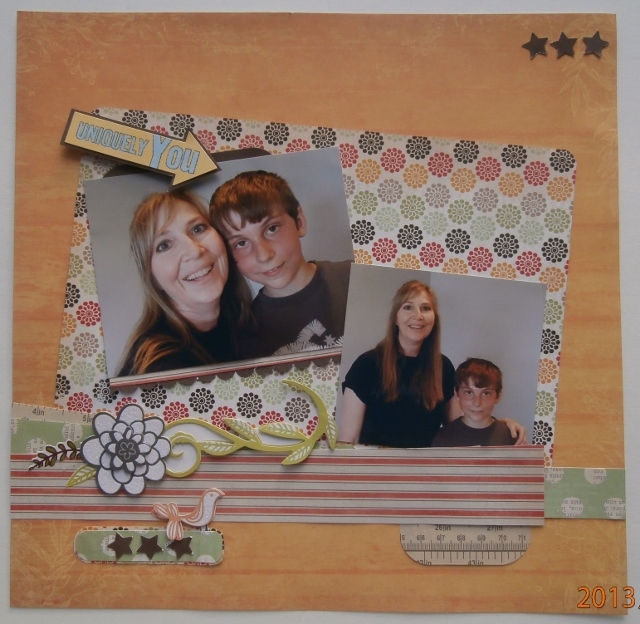 Here's a layout I'd like to share with you that was submitted at Sketches for All for the Photo Collage Challenge (collage). You can see the challenge here. Basically, collage 3+ photos to create your layout. It really isn't that hard... honest! 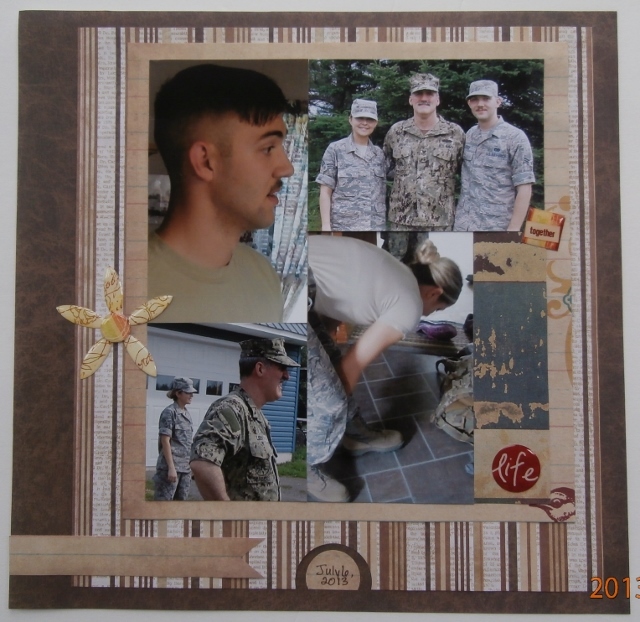 Some photos were taken while getting ready to march in the July 4th Parade... and the top right photo was taken after marching on a very hot day! This epoxy sticker was perfect for my page title. This is life as we know it... every July 4th holiday. 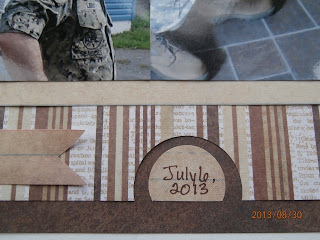 I used a large circle punch and a smaller punch to add in the center with the date on it. Here's a card that was submitted at Sketches 4 All for their Technique Tuesday - Spiral Paper Flowers Challenge (TTPF). You can see the challenge here. 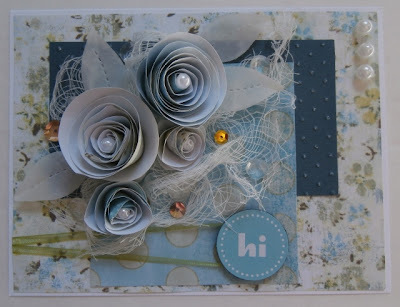 Simply add spiral flowers to your project. I knew I didn't want them all the same size... and this is what I ended up with. They looked a bit plain so I added some cheesecloth under it with clear gems and sequins scattered around the flowers. Here's a closer look at the dimension. A pop dot was also used under the sentiment with ribbon wrapped around it.